He added that an “increased pension salary” for war veterans and their families promised the previous month would come into effect in August. Another issue facing the military since March 30 is the fact that the current Tatmadaw commanders are juniors of the former top generals who now occupy all of the major government leadership positions. This includes not only the president, vice president and house speaker, but also chief ministers of the states and regions. For example, former BSO-5 chief ex Lt-Gen Myint Swe is the current chief minister of Rangoon Region; former BSO-1 chief ex Lt-Gen Tha Aye is chief minister of Sagaing Region; ex Lt-Gen Ye Myint, the former chief of the MAS, is the chief minister of Mandalay Region; and former BSO-4 chief ex Lt-Gen Khin Zaw is chief minister of Tenasserim Region. This situation has created power and business struggles between current and former commanders. In mid-May, for instance, it was reported that Tha Aye, the Sagaing Region chief minister, complained that gold-mining licenses granted by the Northwest RMC, which includes Sagaing, were not in accord with the law, while Ye Myint, the chief minister of Mandalay Region, was engaged in a dispute with Brig-Gen Ye Aung of the Central RMC over granting vehicle licenses to businessmen. The role of the BSO chiefs also overlaps with the responsibilities of state and regional chief ministers. According to Burmese military expert Maung Aung Myoe, the duties of the BSO chiefs include not just overseeing military operations in the RMCs, but also supervising state development projects and coordinating ministerial activities. Under the new power structure, chief ministers are now responsible for supervising state development projects and ministerial coordination. Meanwhile, a number of BSO posts have been left vacant or are about to become vacant. BSO-6 hasn't had a commander since March, when Lt-Gen Soe Win was promoted to deputy commander-in-chief of the defense services, and the top spot at BSO-3 has been unoccupied since Maj-Gen Hla Min was appointed defense minister. Tin Ngwe's retirement means that BSO-5 also has no commander now, and with Myint Soe under investigation, BSO-1 is also likely to become leaderless in the near future. That leaves just two BSO chiefs securely in command: Maj-Gen Aung Than Htut, chief of BSO-2, overseeing the Northeastern, Eastern and Triangle RMCs, and Maj-Gen Thet Naing Win, chief of BSO-4, overseeing the Southeastern and Coastal RMCs. This situation has led to some speculation that the Tatmadaw may return to the days of having just two BSOs, as was the case from 1979 to 2002. The first BSO was formed under Brig-Gen Tun Ye in 1978, when government troops were battling with Communist insurgents northeastern Burma, and the second in 1979. The other four BSOs were formed between 2002 and 2007. "The statues from above picture depict Ne Win, Saw Maung and Than Shwe. It will keep haunting us." WHAT A STUPID INSULT! Such ignorance. A kingdom is the very symbol of civilisation. Burmese culture, heritage and identity had prospered under the emperors. Primitive tribes never achieved the status of kingdom and thus remained backward. Chin Lay should be ashamed of himself. The statues from above picture depict Ne Win, Saw Maung and Than Shwe. It will keep haunting us. Until and unless Tatmadaw becomes professional soldiers, there will be benefit of interest. So why not create and separate politics and soldiers. Let soldiers stays at barrack, not in civil administration. Tatmadaw should engage security affairs of state alone. Once Tatmadaw involves in politics it will automatically take shape corruption and undesirable conflicts within. It's all patronage in Burma. If I may use my twisted logic, this rampant corruption within the army ranks might actually be good for Burma. This level of economic inequity within the Army itself might lead to some sort of mutiny from the foot soldiers and the lower ranks. 2. Get rid of the Chinese exploitation and crony capitalism (which is the root cause of coercion and corruption). Of course, these two factors are very closely related! Pack of wolves kill animal and the wolves are biting each other to get more meat. These generals are no more than wolves. It's not the power struggle between the senior generals and recently promoted junior generals in Burma. It's the circus created by the over-lord to keep all the generals in tow. He wants every general insecure so that each will kowtow to him. All the rumours are spread by the MAS to make the people on toe(Alert). 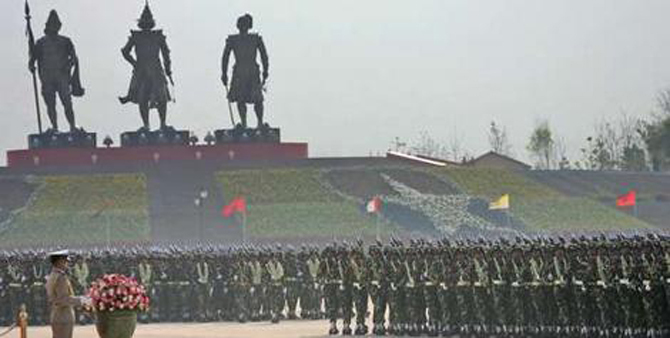 Burma will be peaceful only with a professional army that Bogyoke Aung San had envisioned!